Castelmola, perched on a hilltop, is a good half-day excursion from Taormina, and with footpaths connecting the two, it offers a chance for some exercise to work off all those rich Sicilian meals. On a clear day the views down over Taormina, across the coast and towards Etna are fantastic. 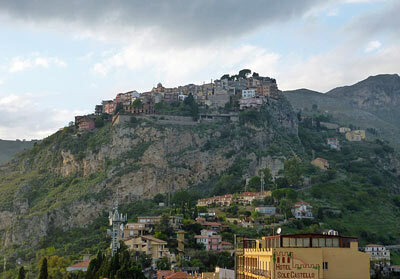 Castelmola is a tiny, picturesque village perched on a craggy hilltop, above and slightly inland from Taormina. You can see it from Giardini Naxos and from some of Taormina's viewpoints, and if you don't mind some steep uphill sections, you can hike from Taormina to Castelmola and back. Many visitors, though will prefer the easier option of catching a public or tourist bus up to Castelmola, and then walking the attractive downhill route back to the larger resort. The village makes a very worthwhile outing, whether you walk, drive or bus. From the wide piazza at the entrance to town, where buses turn, Castelmola is easily explored. Signposted uphill is the village's thirteenth-century castle, the Castello. Now in ruins, this fortress was dramatically situated to command the hills and valleys, so has wonderful views over the surrounding hills and coast. Although it's small and doesn't have any major sights other than its ruined castle, Castelmola is an interesting and picturesque settlement, where a certain rugged authenticity mixes with tourist-oriented craft shops. The little streets and alleys are worth exploring before you make your way back down to Taormina: you'll find a surprisingly imposing Duomo and several smaller churches, including the Chiesa di San Giorgio (1450) which contains a charming little statue of St. George on his charger. 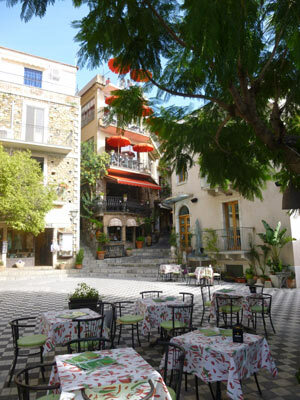 There is a choice of restaurants and cafés in Castelmola, and eating is a pleasant way to spend time here away from expensive and busy Taormina, so timing your visit around lunchtime is a good plan. An alternative is to pick up a picnic lunch from the general store along Via A. de Gasperi (which leads from Piazza San Antonio). You can have the rolls filled with local cheeses or meats, and sit down for a pleasant outdoors meal on the next stretch of the walk. If you are of a robust disposition, one of the strangest sights of Castelmola is the historic Bar Turrisi and its phallic-themed décor. Celebrating in flamboyant style the ancient emblem of fertility and luck, and also the more risqué and libertine aspects of Taormina's history, the bar's interior is filled with penises in every medium and of every size, from large stone sculptures to the bathroom taps. The bar has balconies overlooking the pretty little village piazza, and serves granitas and almond wine, "elixir of love", which you can also buy in souvenir bottles (not all phallic-shaped) to take away. 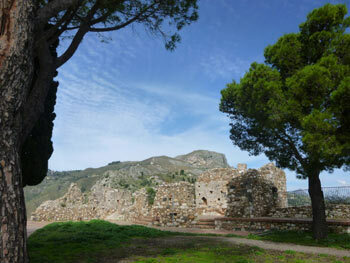 Castelmola is a simple and gritty place in comparison with sybaritic Taormina. It's a picturesque and easy excursion, with the added bonus of an attractive footpath linking the two towns. Although close to Taormina and visited by tourists, it still feels worlds away from the crowded streets of the larger town. With a few places to eat and drink, and a totally different, less touristy feel, Castelmola would be an unusual and atmospheric choice for an overnight stay. There are a few B&B and hotel options in and around the hilltop village, some of which have superb views. In the heart of the village is the Borgo Medievale B&B, with décor inspired by tales of King Arthur. Visitors should consider that the narrow mountain roads make it a tricky base for exploring by car, and the village is very small and quiet in the evenings especially out of season. It's possible to make the excursion from Taormina to Castelmola on foot, taking a circular route which climbs from Taormina to Castelmola, then descends by a different route with the option of including Taormina's Castello Saraceno, the ruined castle poised directly above Taormina. Note that footpaths around Taormina are occasionally damaged by heavy rainfall and landslips (especially after autumn storms), so I'd suggest checking your route with the tourist information office in Taormina before setting off. The first section, Taormina to Castelmola, is the least inspiring stretch, with a big climb, so many visitors will prefer to skip the uphill workout and take a bus from Taormina to Castelmola, before enjoying the more attractive and leisurely walk downhill. From Porta Messina, head uphill and turn right past the fountain and archway. Follow Via Dietro Cappuccini. After a short stretch of road, you'll come to an unobtrusive set of steps on the left, Salita Branco, also signposted for Castelmola. Once an old mule-path, the concrete steps head upwards past the buildings of the local school. This climb is tiring and not particularly interesting, apart from the views back over the sea. Emerging on Via Branco, take the left hand bend, uphill. When you reach the main road, cross over. Take the lane which continues upwards towards a cluster of houses. Following the small signs for Castelmola (with a pedestrian symbol) you'll find yourself on a path winding around to the right, under the crags on which the village sits. Looking back, you may see traces of the historic necropolis on the ridge - but you'll get a better view on the route back down. The steps are steep, so when you emerge into Castelmola's Piazza San Antonio you'll probably feel you deserve a long cold drink at the outdoor tables of the Bar San Giorgio. Aim downhill from the area of the Duomo, and you should find yourself on a road wide enough for cars, curving around the base of the village. After a sharp bend, the pedestrian path to Taormina descends from this road, with a signpost to identify it. First port of call is the tiny Chiesa di San Biagio, which - according to the sign outside - dates back to the first century. Inside is a damaged eighteenth-century fresco. Although money has been spent on this footpath at one point (hand rails, paved steps and lamp-posts), maintenance is evidently intermittent. 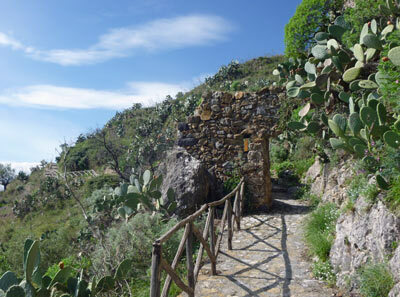 The path is lovely, dropping through ancient agricultural terraces - mostly now overgrown with prickly pears and rampant wild flowers, which also quilt the grassy banks. A few intriguing cottages, semi-ruined, dot the slopes. After a picnic spot, as you approach a ridge, look upwards for a view of the necropolis: a rocky outcrop above, peppered with dark grave-openings. Shortly after this, the path passes through a ruined stone gateway. It finally descends in little steps to a narrow lane which you follow until it emerges onto a bend of via Leonardo da Vinci. This path is called the Sentiero dei Saraceni. An old mule path connecting Taormina and Castelmola, it is said to have been used by the Saracens who besieged Taormina a thousand years ago. The ruined arch, a surviving part of ancient town defences, is known as the Porta dei Saraceni. From this point you can either descend to Taormina, or continue with another climb up to the Castello Saraceno and the Santuario della Madonna della Rocca (see 'Things to do' page) above the town. To visit these other sights, continue for a short way along the main road to the left. Then a staircase on the left allows you to head straight uphill, cutting through the zigzagging streets. A stiff climb later, and you emerge on the spine of the ridge, by a bus stop on the main road. Cross over for the approach road for the Castello (which passes several bars and restaurants). There are great views over Taormina from outside the chapel at the end of the lane, the Santuario della Madonna della Rocca. A path leads upwards to the castello entrance: however at the time of writing the ruins have been closed to the public for years. 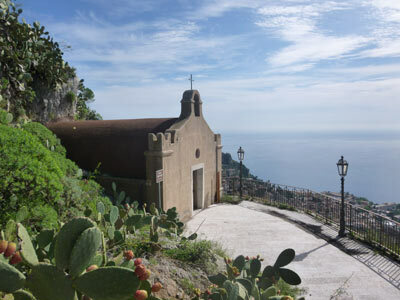 Back at the chapel, a long zigzag path leads back down to Taormina, past the traditional Stations of the Cross, offering plenty more panoramic photo-opportunities. You emerge on Via Circonvallazione, above Corso Umberto. To miss this detour, and head straight on down into Taormina, head downhill around the bend in the road. You can simply follow the winding road around into the town centre, or head downhill through smaller streets, starting with a right turn onto Via Wilhelm Von Gloden and dropping to the left down the steps of Via Salita Celestina Penna, leading to Via Paterno di Biscari and then cutting to the right down Via della Chiusa or Vico Polibio. The route emerges onto a busier street (Via Diodoro Siculo/Via Apollo Arcageta), leading to the Porta Catania and Corso Umberto. Our selection of the best (and the best value) Taormina hotels and B&Bs, with reviews and online booking.